Hey everybody, we’re here with GM Rase Cidraen to talk to him about his awesome World of Darkness campaign The Dark Queen of the West this month. Yeah it’s up a little late, but it was totally worth the wait. Check out the interview below! 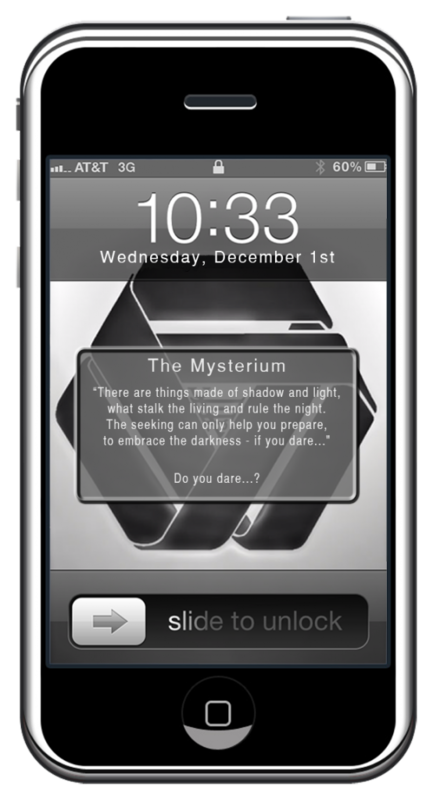 First off, feel free to tell us about the person behind the GM screen. Where are you from? What do you do both aside from gaming? Alter Ego’s? Wife and kids? Where can we stalk you on the internet? I have to start by saying that it’s truly an honor to even be on Obsidian Portal. I’ve always had a foot in two different worlds (a third, if you count the world of the fantastical and my second left foot) – I come from a deeply southern family, but have lived most of my life in the Northeast corridor of the United States, spending a good number of years up in Boston. That’s where I fell in love with my wife and my gaming career really took off. Aside from tabletop gaming, I play a good deal of video games, with a side of minor cinephilia and an enthusiasm (but lack of time) for musical composition, image manipulation, and authorial inclinations. If you’re going to stalk me, the best place to do it is right here. I’m active on the forums as much as I can be, but I’ll always take the time out to talk to anyone who sends me a message. Nothing makes me happier than meeting people who enjoy our hobby and helping them out however I can. I’ve had a couple of really successful art-for-words exchanges with some excellent people on the site. Tell us about The Dark Queen of the West in a nutshell. How did it come to be and how long has the campaign been going on? We play… well, it’s sort of hard to describe, but it’s more or less constantly. We’re all scattered around the country, so it’s hard to schedule a concrete time for everyone to meet, especially since I’m already in the fantastic Edgerunners . What we’ve built is a fairly relaxed Play by Post story where we play as often as time allows, and it’s worked thus far. World of Darkness seems like a blast. I’ve always really wanted to try it. How do you like the system and what do you find to be its strong points? Weak ones? The system itself is really interesting, particularly the flavor – if there’s one downfall that I’ve found, it lacks a certain flexibility that I was hoping, even with the improvised magic system. Aside from WoD, I’m sure you play other systems too, which ones do you play most? I have had the most experience with the D&D editions starting from 2E onwards, settling mostly on 3.5e. I have recently fallen in love with GURPS for the sheer flexibility that it offers. I was dragged into tabletop gaming from a group I was playing video games with, and it was further cemented by the Network Administrator for my local public high school, who taught me the old Mage system as well as D&D and martial arts. I’ve been around long enough that some people have started to consider me as part of the furniture. Between myself and co-founder Gaaran, we’ve got a good number of years between us – I started back in 2009, and he’s been around even longer. I was brought to the site by a desire to build a world for players to play in, and I stayed for the community. Your Wiki is so amazing I almost needed to change my pants, who does all the work? The work on the world is a labor of love between both Gaaran and I – we have regular meetings to decide what direction to take the site in, and what elements need tweaking and improving. We both love creating art assets of the site, and Gaaran has been able to turn a mean hand of code developing elements like Our Map which I find amazingly useful. His coding is truly what makes the site what it is – it used to be that I could keep up, but now it’s the best I can do to stay on top of the art asset and fluff demand, and plan on adding even more to the News page when the group gets up to more unexplainable hyjinks. The Portal helps me stay sane when it comes to organization. I’m a disorganized mess in real life, so having a place to store all of my thoughts and remind me of incidental NPCs that my characters and I create is absolutely invaluable. Gaaran is very active, as is my wife, and Bohemond will be once we get to his part in the story. The best part of the game has been working with the beautiful and talented people of the site (my wife included), but if I had to pick a single moment, I’d be hard pressed between a few. I loved Duskreign’s alternate takes on our sessions, tweaking what would have otherwise been a mundane encounter into something fascinating. I loved Jon’s vampire breaking into his own museum, as well as Westin, James and Marie (Our resident mages and vampire) dealing with a den of vampires in an apartment slum, struggling to come to grips with their respective abilities. 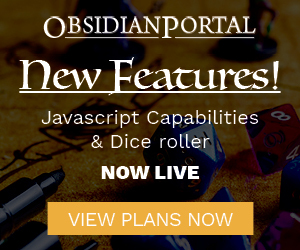 Are you excited about the upcoming changes to Obsidian Portal? I am so excited about the upcoming changes it’s hard to express – the moment I heard about it, I went and backed the Kickstarter immediately – I have absolute trust in Micah and crew to deliver something amazing – that’s why I Ascended in the first place. This place is something special, and I want to contribute to keeping it that way! I’m hardly one to talk about wisdom, but I’ll do my best to impart some words. The most important thing that I have ever had to remember is that while you might be running the game, it’s not really your story. It might have started from an idea you had, or stole, created or remade, but the moment you put that idea in front of your players? It stops being just yours, but theirs as well. It becomes something amazing – a shared experience among friends, something wild and unpredictable. It’s time to just sit back and enjoy whatever happens, because you’ll have created something alive. Nothing will go as you planned, and that’s okay, because it’ll be more interesting to everyone involved. A meticulously planned story is not as fun as something that surprises and delights everyone involved. My players are constantly surprising me in ways that I never could expect, and I would never want it any other way. Well that’s it for this month everyone, stay tune for next month when we’ll have another amazing campaign for you all. Have you got someone you’d like to nominate? Shoot me a message or shout it out on the forums! Oh, Rase, dear friend, how long has this day been coming! In those halcyon days, when the storms of real-life torments abated, I was afforded the opportunity to enjoy this campaign, and I remember well how thrilling it was to be a part of, even in its infancy. I miss you guys, too, but most of all, I’m proud of all that you’ve done in the time since last we skyped, way back when my days and nights cooperated with my designs to game and dream. Congratulations on all your successes, and I pray you many more and greater successes, just over your every horizon. I really like how interactive the site is. It’s clearly a project built on a love for the game. Congratulations on CotM. It’s well deserved! Congrats Rase! I for one have loved what we’ve come up with, and only wish that it wasn’t so time consuming, because then we could have even more of it! Hats off to you for making a game that I like enough to work so hard on :). Maybe this will get us off our butts to get some long over due work on the wiki done ;). I must say, we definitely couldn’t have gotten all of this done without the helpful community that’s always been a part of the Obsidian Portal. I’m glad to see some of the same faces around that started all of this! Thanks for your insights, Raes! And congratulations on DARK QUEEN! So totally well deserved! I’ve been a fan of Dark Queen for some time. This is long overdue! Congratulations! You really hit the nail on the head with your comment about how the story takes on its own life. It is amazing what can happen when you put a bunch of brains together to tell a story. I think that is really the reason why we all love RPGs so much. Congratulations Rase Cidraen, looks like a great site and campaign! Love your ‘Pearl’, which is something I’ve really come to embrace with my own campaign too and advice that any group, playing any system could benefit from.